One of our most popular curved stairlifts has just got even better. 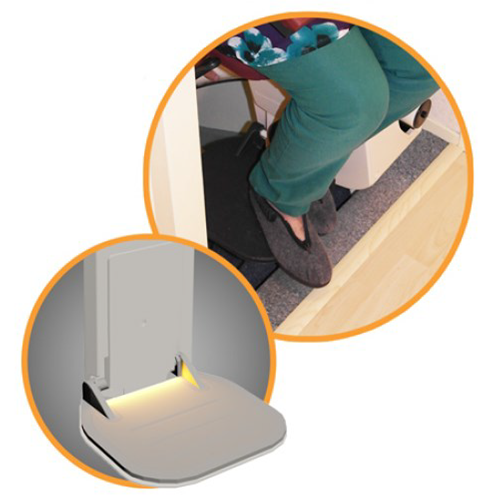 The Handicare Freelift has introduced a large footrest option at no extra cost! At 60mm wider this larger footplate can finish flush with the landing thus bridging the gap between the seat and the landing which makes getting on and off the less daunting for users. It also offers users a larger area when it comes to resting feet during travel which, in turn, makes it easier to find a comfortable, supported seated position. With no raised sides it facilitates easier transfers between surfaces. Available with an illuminated power option for the ultimate footrest experience. The Handicare Freelift is just one of many different makes and models of stairlifts Advanced Stairlifts supply, install and maintain. We have stairlift solutions for straight and curved stairs, narrow stairs, steep stairs, stairlifts for the shorter or heavier user and stairlifts with hinged rails, where there is a door at the foot of the stairs. Book now for a free, no obligation survey and quote from one of our highly experienced stairlift surveyors. It’s a decision that could transform your life!